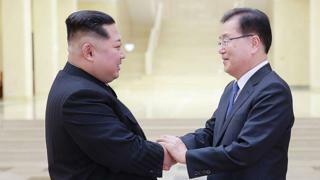 North Korean leader Kim Jong-un has hosted a dinner for senior South Korean delegates - the first time officials from Seoul have met the young leader since he took office in 2011. The South Korean president's office confirmed the meeting shortly after the delegates' arrival on Monday. The 10-member team is in Pyongyang for talks partly aimed at restarting dialogue between the North and the US. Relations between the Koreas have warmed following last month's Olympics. In an unprecedented move, the South Korean delegation includes two ministerial-level envoys - intelligence chief Suh Hoon and National Security adviser Chung Eui-yong. North Korean state radio earlier said the delegation was met at the airport by Ri Son-gwon, North Korea's reunification chief, who led talks in the weeks before the Winter Olympics. During the two-day visit, the South Korean group will focus on establishing conditions for talks aimed at getting rid of the North's nuclear weapons as well as dialogue between the US and Pyongyang. Mr Chung had earlier told a press briefing he would deliver President Moon Jae-in's "resolution to maintain the dialogue and improvement in relations between the South and the North... [and] to denuclearize the Korean peninsula". "I plan to hold in-depth discussions on various ways to continue talks between not only the South and the North, but also the North and the United States," he added. US President Donald Trump said on Saturday that the US would be prepared to meet North Korea, but reiterated that Pyongyang would first have to "denuke". However, North Korea - which has said it wants to talk to the US - said it was "preposterous" for the US to insist on preconditions. "The US attitude shown after we clarified our intention for dialogue compels us to only think that the US is not interested in resuming... dialogue," said the foreign ministry in a statement reported by state media. It remains unclear who would represent the US in any such meeting. Winter Olympics: Is window for US-North Korea peace closing? Have the Winter Olympics repaired North-South Korea relations? Kim Jong-un meeting South Korean ministers face to face for the first time is a pretty big deal. He has met very few foreign officials since he became leader in 2011, and the last time envoys from the South visited Pyongyang was in 2007. But the young North Korean leader appears to be turning on the charm, again - treating the South Koreans to a banquet. However, the after-dinner conversation could be awkward. South Korea really needs Pyongyang and Washington to talk to one another. The problem is the two sides have different terms when it comes to even starting those discussions. President Trump has said Kim Jong-un must be willing to "denuke". North Korea has rejected this precondition, and has some of its own - especially over joint US-South Korea military drills, due to resume in April. It's going to take some deft diplomatic skills over dinner to try to get these two sides together before those exercises begin. The top US diplomat on North Korea Joseph Yun announced his decision to retire earlier last week, a departure which could hamper the Trump administration. Analysts believe that Mr Yun was very much in favour of compromise and diplomacy with North Korea. The relationship between the US and North Korea was particularly tense before the Pyeongchang Winter Olympics, with both countries repeatedly threatening each other with total destruction. But the Games saw the two Koreas march together under a single flag - the outcome of the first inter-Korean talks in two years. The question now being asked is whether North Korea's participation in the Paralympics, starting this week, can lead to an even bigger breakthrough. The US has distanced itself from the North Korean overtures during the Games. US Vice-President Mike Pence has said there is "no daylight" between the US and its regional allies on the need to "continue to isolate North Korea economically and diplomatically until they abandon their nuclear and ballistic missile programme. North Korea has also issued a warning about the scheduled US-South Korea military drills, which it views as a provocation. The next set of exercises is due to begin in April. A report last week in the ruling party's Rodong Sinmun newspaper said the military exercises "cannot be tolerated under any circumstances". "Their (intention) is to blow away the atmosphere of improved North-South relations... this should be regarded as outrageously insane behaviour by confrontation fanatics who are anxious to bring about disaster," the report read. Winter Olympics: Is window for US-N Korea peace closing?